We can elevate your event to the next level with our highly advanced lighting setups and design. Clients often underestimate the importance of lighting, but we know how lighting can raise the par of your event. Our LED fixtures are controllable to fade, change color, strobe, change rotation speed and even move to the beat of the music. Setups are custom designed in relation to the size of the dance floor, ceiling height of the venue, and the type of event. Create beauty, elegance, and a unique look to your event with a custom-made light projection! You can display your wedding monogram, company name, or almost anything to appear on almost any surface. If you believe your venue needs a little help or want to transform your room, add a palette of color to highlight pillars and walls. 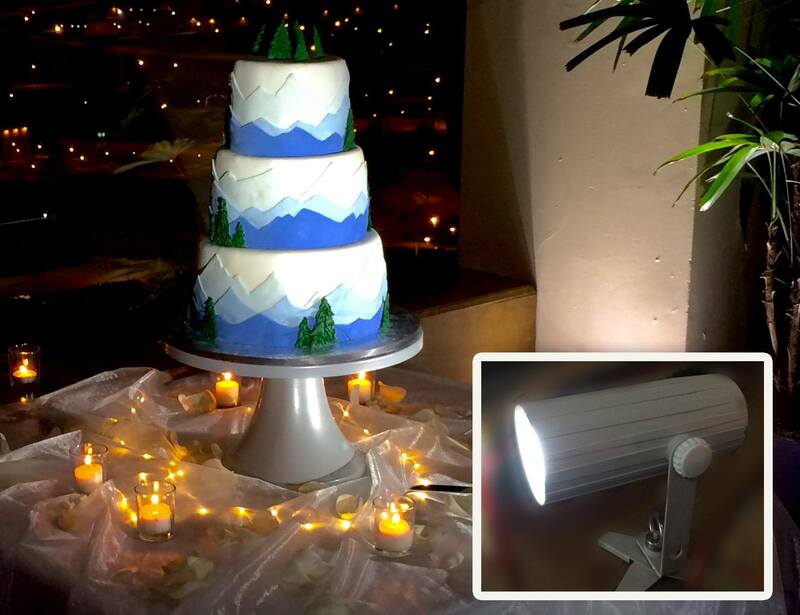 Did you spend a lot of money on your wedding cake just to place it in the dark corner of your banquet room? Let us highlight the cake and make it a centerpiece of confectionery artwork! We can provide infrared controlled, battery powered LED fixtures that can provide up to 11 hours of illumination. The fixtures include a base stand, a special clip mount for suspended ceiling grid, and even has a built in magnet. Event Pricing for Lighting Design & Effects is different for every event. It is based on room dimensions, ceiling height, trussing, cabling, rigging labor, and overall number of fixtures required to attain the level of ‘wow’ the client is requesting.